I conceived the idea of modelling a real location when I watched a video from the Kalmbach "Hotspots" series, "Rosenberg, Texas". I was intrigued by it because it offered a location where two great railroads (the SP and the Santa Fe) crossed at grade but ran parallel for a way beyond the junction. It was also the location of the last working interlocking tower in Texas, Tower 17. UP and BNSF trackplans, Bing Maps and Google Earth made it all the more possible to do. I am modelling the modern era from 1990 onwards to the present day (although the interlocking tower is now renoved).Traffic is very wide-reaching from Amtrak's Sunset Limited, trans-continental stack trains, grain extras, rock trains, coal for Texas power stations, chemicals and oil products, manifests between the South and points West plus SP/ATSF locals. In fact virtually anything goes. However when I started building that part of the layout, I had not then moved house where I could set up the layout completely in a purpose-built log cabin at the top of the garden. Having got the cabin and I could then plan how I could blend Rosenberg into a complete layout. One other key factor was committing build a complete town for Essex Belt Lines to appear at the Ally Pally show in 2013. It was to be 5' 2" by 17' 2" L shape to create one corner. This became Dillon - a fictitous town somewhere in Texas based on the "Friday Night Lights" series about college football. This has been married together with Rosenberg to create the above plan. The layout measures 36 by 14. What is built so far are all the boards that comprise the outer circuit of the room, including the delta junction at right plus the yard throat and the reverse loops at bottom left and the yard throat at the left end of the yard. The yard through the centre and top connector to Tower 17 at the junction are yet to be started. All track is in place but only juiced as far as the right hand end of Dillon at bottom all the way clockwise to the board immediately to the right (West) of the crossing at Tower 17. I will post some photos as time permits - I do have a good number already, especially of Dillon. Rosenberg as modelled is not what you might call photogenic. But time will tell. Last edited by tunnelmotor on Wed Aug 27, 2014 9:02 am, edited 2 times in total. Koos, is that an offer? I have a good crew around this area that I wll be able to call upon to run it properly but I hope I have enough years left in me to complete this one. I hope to have wired up all of the circuit around the outside by the end of this month. Then I can set about some weathering of track and scenery. That will take quite a while but I enjoy that part of it. The yard will be the last phase - that is when I find it is still too small for the stock I have. The yard will have seven storage/classification roads with three tracks for passing traffic, one at top and two at bottom. There will also be a passenger depot with a platform between the two bottom tracks. I may eventually reinstate the Rosenberg stop too making a total of three - the building was demolished some years ago but I have a Walthers Mission-style kit to adapt to make it look like Rosenberg's. 1) Looking south towards the depot on the curve in the distance; lumber yard at rear right and various warehouses along the back and a produce centre at the front. 2) The other end of Dillon - passenger depot at bottom with DRGW GP60 power coming in to switch the local. 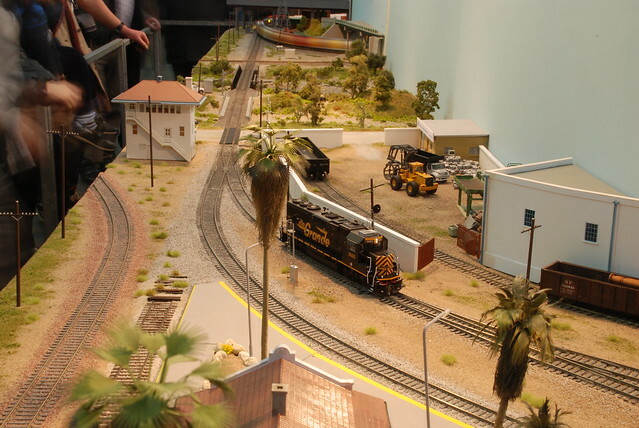 Walthers ATSF Interlocking Tower overlooks the scene. On Dillon, there is a 90 degree crossing immediately beyond the Tower where the ATSF crosses the SP tracks. The ATSF track is just cosmetic and non-working. 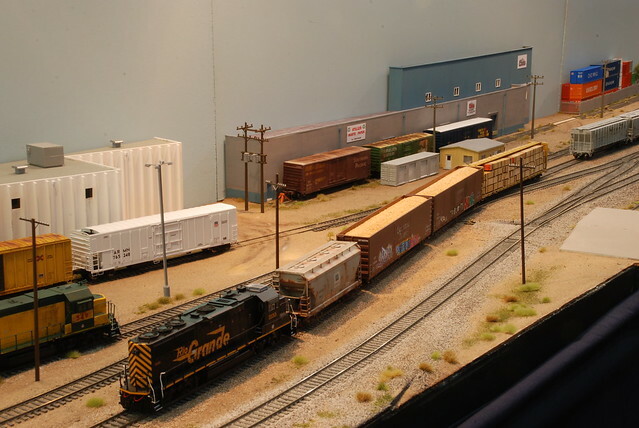 3) Switching in progress putting together the local for the return trip to the yard in Houston - UP GP15-1s wait patiently. Looks great Mike, If I were closer I would gladly help, but never say never. 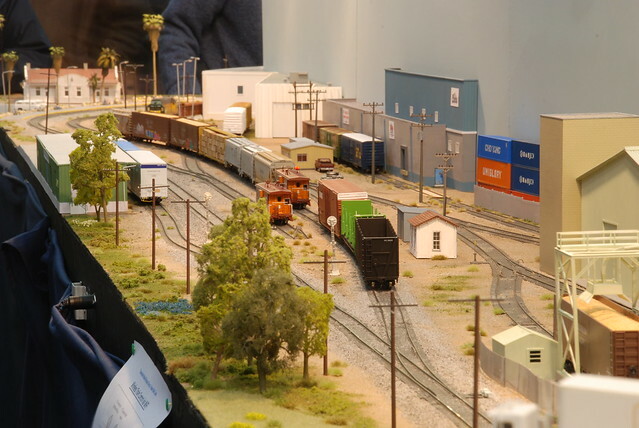 I have written a two-part article on the layout for Roundhouse - Part 1 in October 2015; Part 2 may be in February 2016. Great looking trackwork... would like to see more photos.